I found this dictionary thanks to a video on The Kid Should See This, introducing Kapa Haka, a traditional Maori dance. The dance was to intimidate the enemy but also to try to deescalate tensions and prevent the battle from happening. There was another missile launch today. There’s not much we can do about that, but we can continue to try to learn as much as we can about the country and its people and the current situation and its history. All three videos below contain plenty of Korean language, so those of you majoring in Korean will get some listening practice. This is part 3 of a series on North Korea. This one is about an artist who used to do propaganda for the regime. Now as a defector, he uses his art for other purposes. Part 2 is about the US military presence in South Korea, and also a pretty tense scene of the reporter and her guides trying to get to a remote village, but are prevented by the SK military. There’s also an old grandma with a real potty mouth at the end. Can hardly blame her. The title of today’s post is from the last lines of this video. Part 1 is about the DMZ (the border between SK and NK). In some classes this term, students have been making surveys to collect information about people’s knowledge, experiences, and opinions on a variety of themes. I happened across this article this morning that has an interesting survey. They want to know: “Have you experienced or witnessed hate?” Their goal is to collect people’s stories to better understand hate crimes and discrimination. This survey appears to be only collecting information about discrimination and hate from the U.S., but it’s a good discussion starter and may help you with your own surveys. Reading this reminded me of a bus ride I was on in Cambodia. 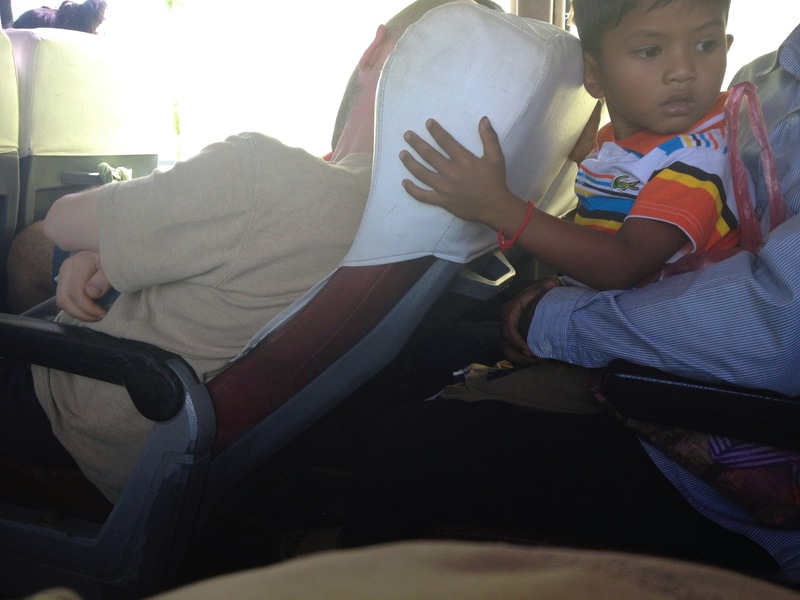 Across the aisle, I saw a man reclined in his seat, sleeping peacefully, while the mother and child behind him looked less than comfortable. What do you think? Should the man have checked first before he reclined fully? Or is it the responsiblity of the bus manufacturer to design better buses, trains and plances, to make sure kids-on-laps aren’t squished?